The following is original analysis and commentary based on events affecting Hoboken and the nation in recent days. 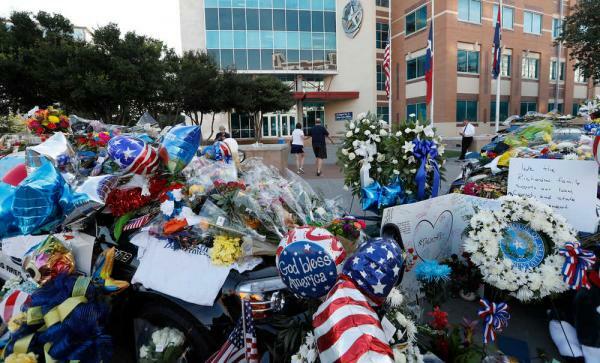 Two police cars in Dallas, Texas flooded with flowers and messages after the politically motivated ambush and murder of five officers and six others injured. Reportedly the killer told police he wanted to exterminate white people especially white police officers after two widely reported African American deaths in Minnesota and Louisiana. Imagine you begin your work day preparing work clothes and in so doing become a target for assassination. Your job to uphold the law may on any given day see a stand down order permitting "protesters" to publicly exhort numerous anti-American revolutionary anthems, ending your life and that of your colleagues is considered fair game. In Phoenix over the weekend, protesters chanted to the police "We should shoot you." Similar "protests" have been allowed if not encouraged from many corners - all with government approval at the highest levels. Unlike other government officials, the police as officers of the law are expected to take it and remain professional at all times. Meet today's transformed America and what every police officer in America now faces on a daily basis when putting on their uniform before venturing out into the public. The murders in Dallas should come as a surprise to exactly nobody, since this is the end point those supporting the BLM movement have tacitly -- or openly -- encouraged. The cry of "off the pigs" has been with us since Bill Ayers (some guy in Barack Obama's neighborhood, never heard of him) was a pup. Just over a year ago, horrified Americans learned of the assassination of two police officers in their police car eating lunch. This time another Black Lives Matter inspired supporter ambushed double digits of police officers, some shot in the back as they rushed to the scene directing civilians in the chaos to safety, most of them in no small irony minorities. ISIS wishes it could be this effective in recruiting domestic terrorists. George Soros funded Black Lives Matter agitation has seen public chants of "What do we want? Dead Cops!" with similar flavored chants elsewhere to turn police officers into bacon for years and none of it accountable in the eMedia or government officials looking the other way. 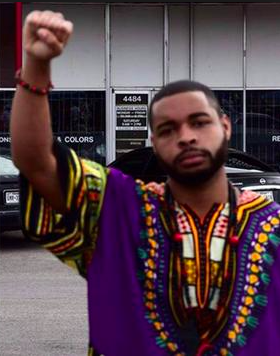 in a Black Power pose and dashiki on his Facebook page. He had been a member of the Black Panthers and other militant groups and is being hailed a hero by many Black Lives Matter supporters. His ambush weeks in the making came after the rapid fire nationalization of African American deaths in police actions in Minnesota and Louisiana by the eMedia, Minnesota governor and Barack Obama. The rest of America awaits investigation of those two fatal incidents. There's numerous reports of militant or terrorist groups on Facebook who have been urging police murders and BLM supporters hailing the body count. So far no outcry or public demands any of it be repudiated as weakly pedddled by Black Lives Matters, a militant group whose leadership lionizes a convicted cop killer that currently appears on the FBI's most wanted list. Michah Johnson seen by neighbors in "training" preplanned his ambush over weeks telling Dallas police when cornered he was inspired to take action that day after the national reports of two fatal African-American shootings. Acting stupidly unfortunately before the facts are known has become the de rigueur norm by both the eMedia and government officials. Racism as many other problems exists in many places and as Americans are learning this week, in many minds. Policing is performed by imperfect men and women, fallible under stress where training is critical in adeptly handling numerous circumstances. The constant refrain police are waking up in the morning going out to shoot African Americans at staggering rates is not only a myth, it's a fallacy of the worst political propaganda. Putting statistics aside which will not convince any safe space congregants, the resultant grotesque pronouncements and enticed divisions have seen further police attacks in several states with murderous intent over the weekend. Police officers and bystanders caught in the crossfire were reported by the Associated Press in Tennessee, Missouri and Georgia. Police murders are up 44% this year adding another over the weekend. At a minimum the Ferguson Effect, the irrefutable increase in homicides in dozen of American cities suggests the front line, the police, do not wish to bear the brunt and be scapegoated further for the pathologies they have no hand in creating. A timely new book reflects on the climbing homicides in scores of American cities, the first in a quarter century demonstrate how counterproductive Black Lives Matters and its political agenda is - in the increased deaths of African Americans having nothing to do with proactive actions by law enforcement. Police have had no role in the pathologies of decades long increases in single parent headed families or the gangster rap glorification blasting out loud decibels nursery rhyming its misogyny, criminality and glorification of violence. The police are cognizant they are simultaneously the front line and the last line of defense. On any given day, one of an estimated 11 million annual arrests in the United States can go wrong. An African American, Philando Castile in Minnesota matched photos of an armed robbery suspect at a nearby convenience store with lethal consequences when a stop went horribly wrong. In equally horrid fashion, the Minnesota governor irresponsibly declared it a racially motivated police shooting mere minutes afterwards, followed by Barack Obama commenting the same day on the other side of the Atlantic in Poland. Especially since the rioting and burning of Ferguson; this is a habitual ritual the eMedia, government officials and their allies partake. After last weekend, there's more blood on their hands. It's of no consequence to the eMedia or their political allies the Minnesota police officer isn't Caucasian. A bad shoot in law enforcement parlance does not in and of itself demonstrate malicious intent. Such a designation can only be made after an investigation. There are exceptions as in the South Carolina Walter Scott case last year who was actually shot in the back. But 60 shootings alone took place in Chicago last July 4th weekend. Not a single one was elevated by the eMedia, the White House or Black Lives Matter to national attention. Those homicides account for the vast majority of African American young men's deaths. June was another record set by Americans using their Second Amendment civil rights to buy arms. Women happen to be the fastest growing group using their civil rights to self-defense. Before the most recent events, Americans were generating 52,000 background checks a day in seeking purchases. You think with what they're seeing from this government they're about to see that figure diminish? The political focus on attacking police is rooted in an attack on the foundation of the republic. What do you think they wish to install in its place? 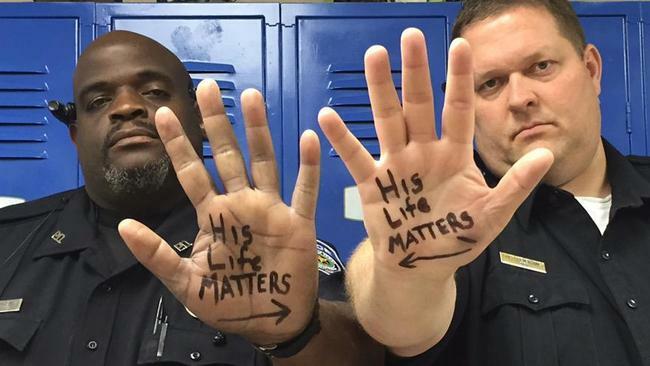 Two police officers dared to differ with the selective politics of who's life matters. They faced attack as did former Dallas Cowboy and local resident Deion Sanders who dared to tweet "All lives Matter! #truth"
Talking Ed Note: 1968 has returned and wants its radical revolution back. But remember, all lies matter. Swallowing whole the poison fed nationally in recent years is not good for anyone. Instead, please take a minute to thank your neighborhood Hoboken Police Officer when you can. People on the front lines are known to appreciate support from behind the lines "back home."